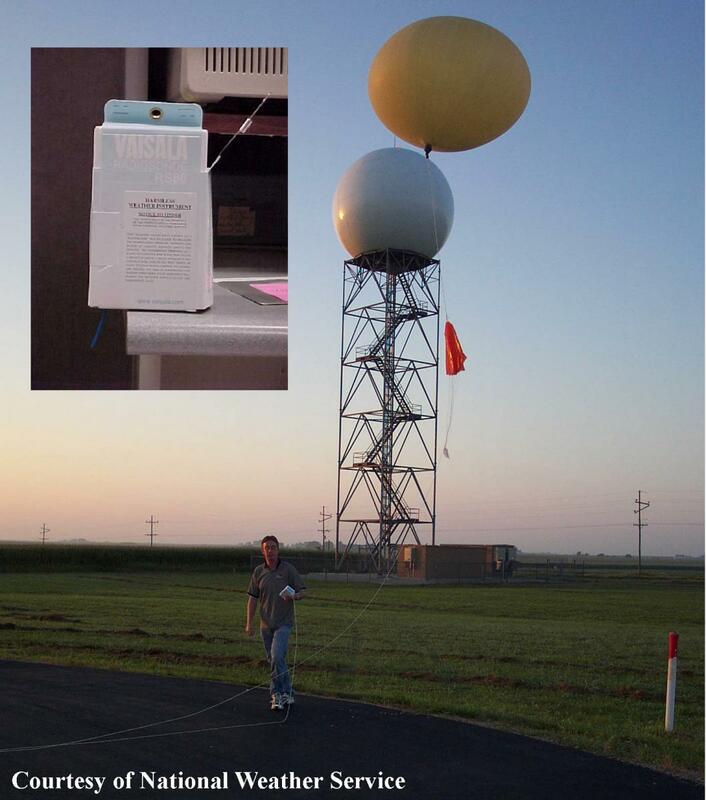 Rawinsonde measure wind speed and direction along with pressure, altitude, geographical position, temperature, and relative humidity. 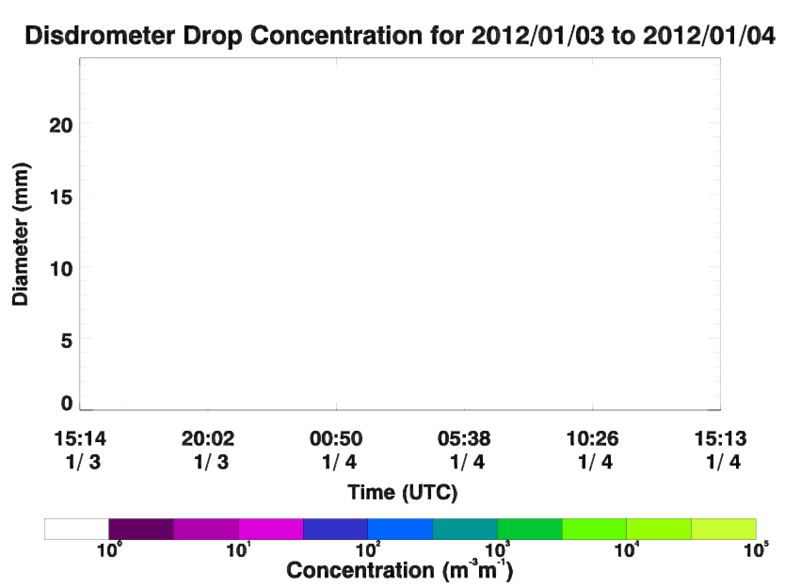 It is launched at 00 UTC and 12 UTC. 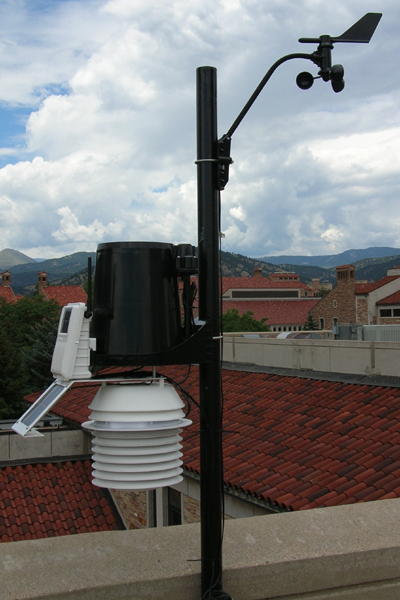 The closest rawinsonde to Boulder is located in Denver, CO.
Microwave Rain Radar (MRR) measures vertical profiles of rain fall rate, liquid water content, and drop size distribution with a high spatial (~30 m) and temporal (~10 s) resolution. MRRs are located at the CU Research Station (latest observations see below) and on the CU Campus (latest osbervations see below). Radiometer provides continuous humidity and temperature profiles with radiosonde-equivalent accuracy. It also provides liquid profiles.  Ceilometer provides information about the height of cloud base from the surface. This can be related to the temperature at cloud base which determines, to a large extent, the amount of infrared radiation emitted by the atmosphere. 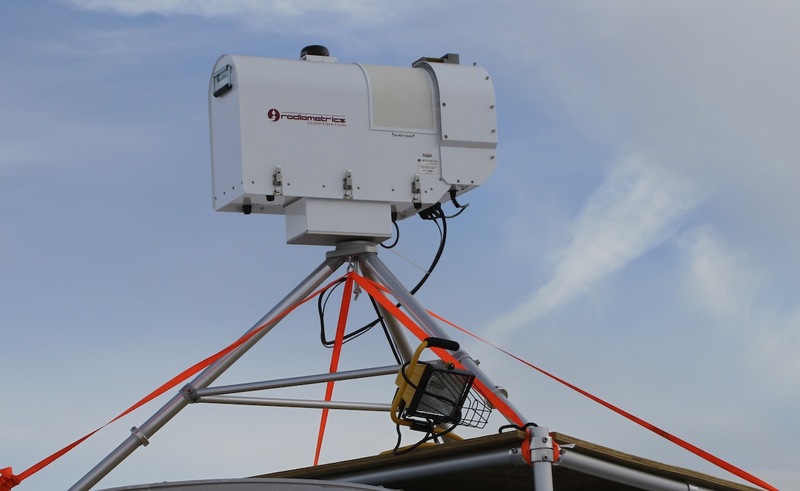 A time series of cloud height data may be used to derive cloud amount and this is important for determining both the solar and infrared components of the radiative energy budget. 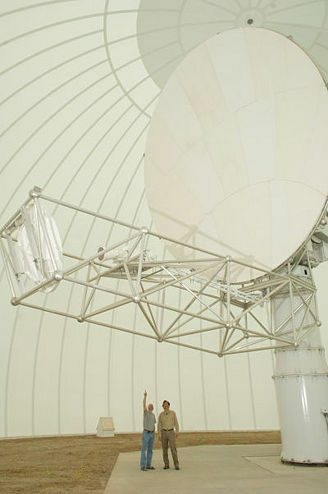 A ceilometer is located on the CU Campus at the Skywatch Observatory. 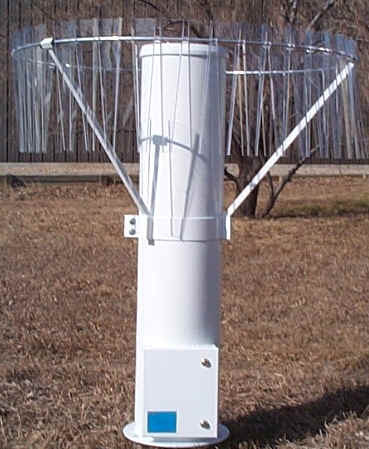 Raingauges record continuously and automatically precipitation intensity. 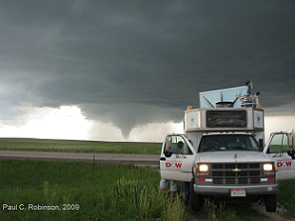 Laser-disdrometer measures size and velocity of each individual precipitation particle and the amount of precipitation. Disdrometer are currently installed at the Mountain Research Station at Soddie and C1, Marshall Field Site and on CU Campus. 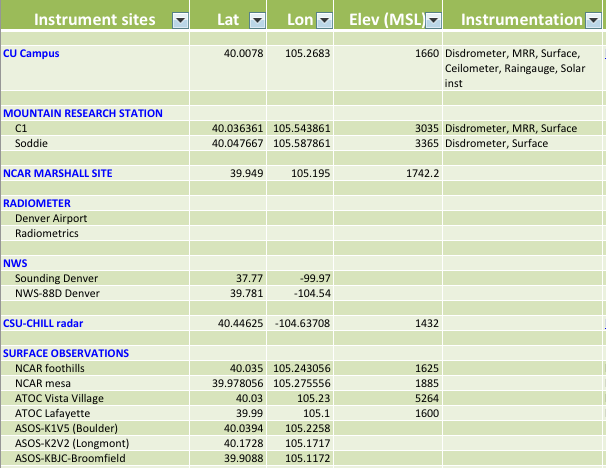 The instruments and their location are listed and shown below. More information about the instruments can be found in the main menu on top of this page. 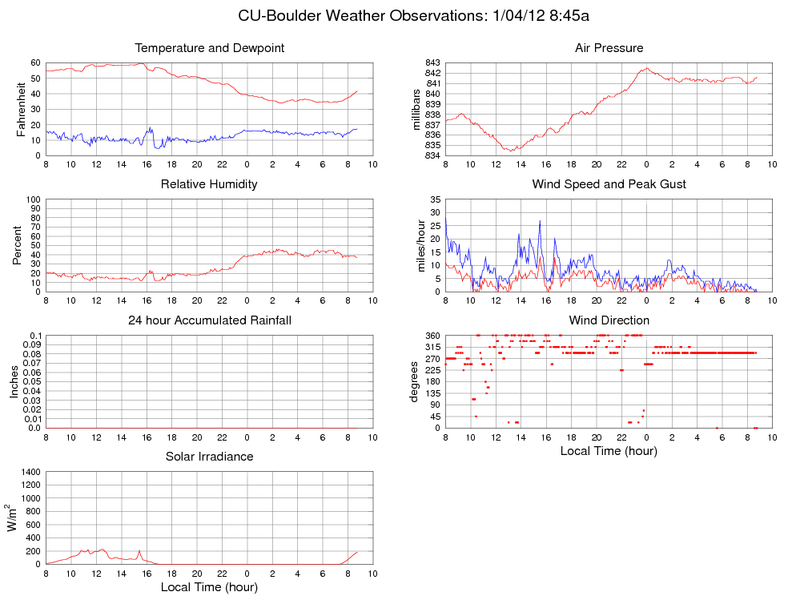 To view current observations from CU campus and the Mountain Research Station <<click here >>. 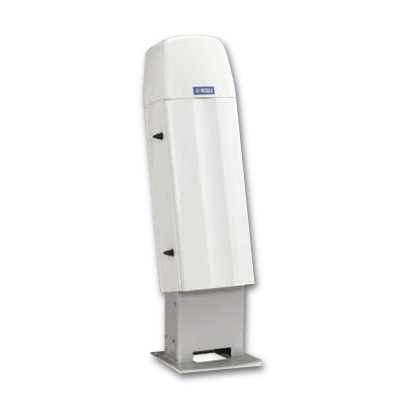 The rapid-scan radar will scan continuously from the bottom to the top changing between LOWresTALL and HIGHresLOW. Lower resolution 3-dimensional volume scans will allow to monitor the flow towards the mountains. 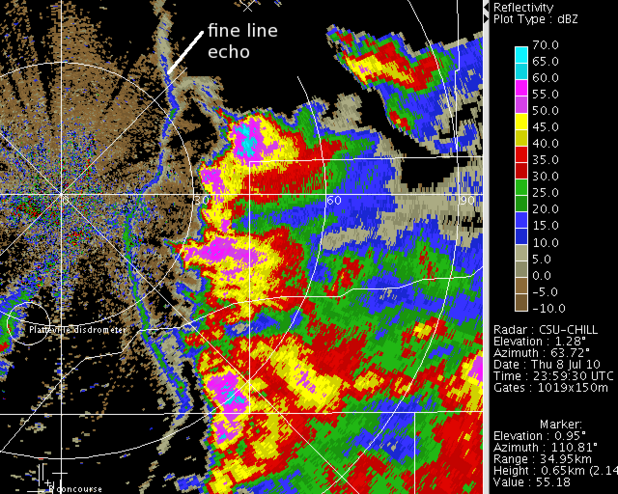 Lower resolution, tall volume scans will be accomplished when precipitation occurs within 30 km range of the radar. High resolution 3-dimensional volume scans will allow to monitor the interaction between the flow and the mountains. High resolution scans close the surface will be accomplished when precipitation reaches the Front Range.